I noticed that my ends were tangling up more lately, detangling was greeting me with some resistance (which is so unlike my hair. Usually detangling is a breeze for me.) and the fairy knots were becoming more prevalent. I finally realized that it was time for a trim. I put my hair into medium size, two strand twists and used my hair cutting sheers to trim my ends. I never cut/trim my hair wet; it's always dry. I could see that at the end of many of the twists were some fairy knots so I would cut just above them. I didn't measure exactly but I couldn't have cut more than a half inch to an inch of hair. My ends look way better and I think the next time I go to detangle and wash my hair, the process should be back to how it usually is, drama free. I need to put myself on a hair trimming schedule. I think the last time I trimmed my hair was back in December and my hair started acting out last month so I think it's safe to say, I need to trim my hair about every 6 months or 2 times a year. From here on out, I will trim my hair every December and June. I don't feel that it is necessary to trim more than that. How often do you trim your hair? Not sure how to trim your own hair? 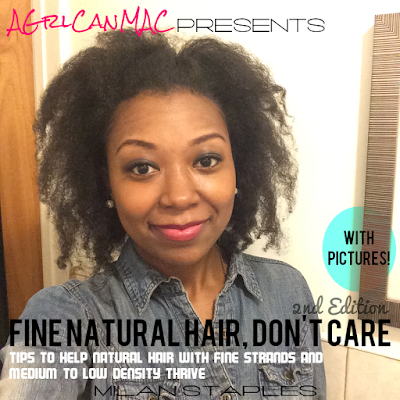 Check out an old article of mine sharing some tips on trimming natural hair. Aw thank you! That fro was slightly shrunken, it is bigger than that! Welcome home again. :D When you have a TWA, trimming isn't as necessary I think. ONce you start exiting TWA land it's more important. If your hair is anything like mine, it'll let you know when it's time for a trim. Happy Hair Growing. Your hair is growing very well! I tend to trim twice a year when, as you mentioned, detangling becomes a chore. I usually trim after taking down box braids since the hair is already separated into small sections. Your so pretty! A natural beauty and I love your fro!